When I see a little Bull Terrier with a patch over one eye, I cannot help but think of the pet of Charles Dicken's most well known villian - Bill Sikes' Bull's-eye. 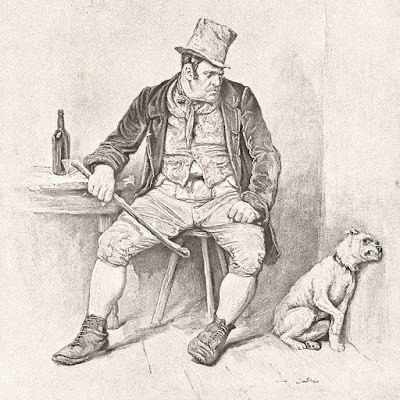 Needless to say we cannot be concerned that the little dog in the photograph was treated with anything other than kindness by his owner, who puts a reassuring arm around the animal whilst they pose for their protrait in front of a naturalistic painted backdrop. 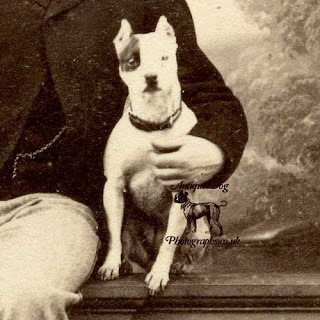 The photographer John Blizard was born in 1826 in Pershore, Worcestershire. Blizard married Sarah Ann Cosnett from Tauton, Somerset in Cheltenham on 9th June 1846. They went on to have five children; Annie, Matilda, Catherine, Ellen & Francis John. 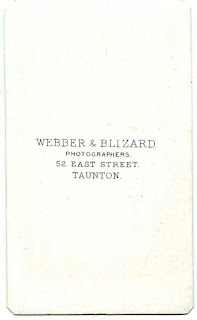 In 1871 Blizard was working as a photographer at his home address of 52 East Street, Taunton, Somerset. Census records show that he employed "1 boy and 2 girls". His wife Sarah's occuaption is also listed as a photograher, and his eldest daughter Annie is listed as a "photographic colourist". 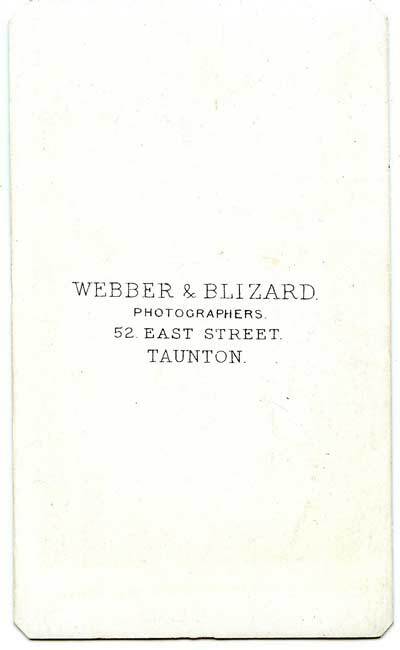 Blizard worked togther with John Webber for only a short time, after the death of Webber, Blizard continued working as a photographer. But within a decade the Blizard family's lives took very different turn. Census records from 1881 show the 54 year old John became Master of The Poor Law, Union Workhouse in Taunton. 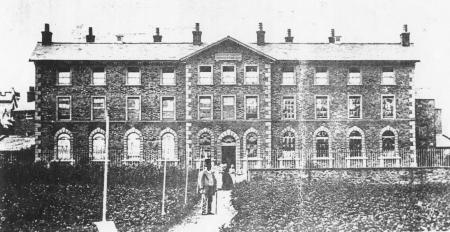 Sarah Ann worked as the Matron and Catherine and Francis John lived at the workhouse with their parents. The people standing on the path are very likely to be John and Sarah Blizard. Marriage of John Blizard 1846. Ancestry.com. Gloucestershire, England, Church of England Marriages and Banns, 1754-1938 [database on-line]. Provo, UT, USA: Ancestry.com Operations, Inc., 2014. John Blizard and family in the 1871 census. Ancestry.com. 1871 England Census [database on-line]. Provo, UT, USA: Ancestry.com Operations Inc, 2004. 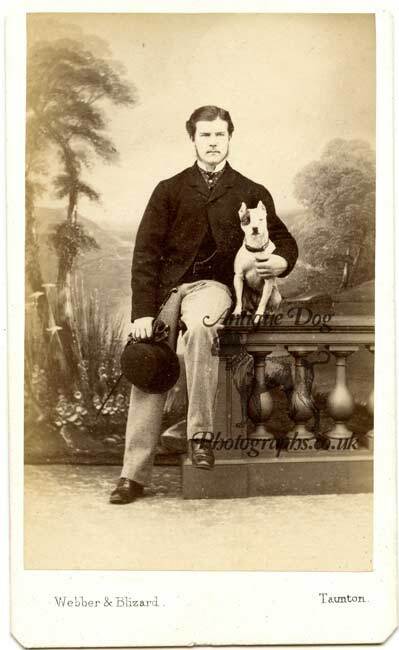 Alternative CDV mount design for "J. Blizard late Webber & Blizard"